Happy New Year all! It’s January 1, 2015 and I couldn’t wait to share this month’s challenge with you! 3 moves: Dips, Leg lifts and Wall Sits>>>helping to strengthen your entire body! These will work your core, upper and lower body each day you choose to do them, increasing in reps and time. I am wishing you all a happy & healthy year!! Look for more monthly challenges to come this year from me! Remember what your mind is focused on will show through your actions. Just make moving your body and eating clean foods your goal. Focus on getting better, stronger, longer, leaner and faster and your body will come into it’s own place of balance and happy. Cheers to 2015! 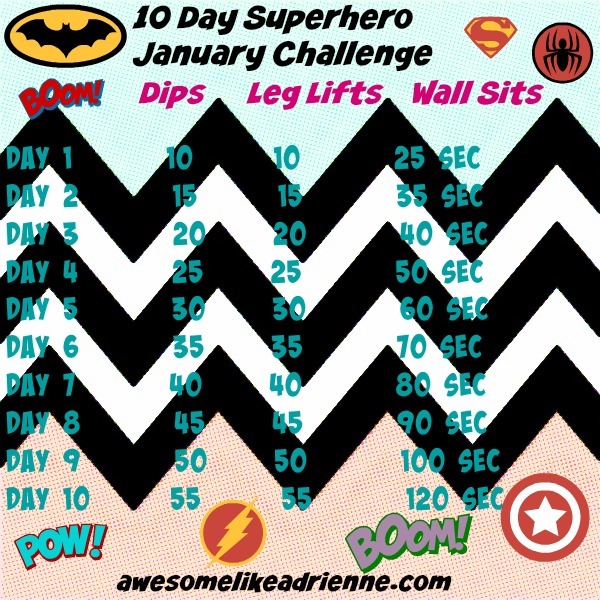 Posted on January 1, 2015 by awesomelikeadriennePosted in 2015 ChallengesTagged challenge, dips, fit, happy, healthy, leg lifts, strong, superhero, wall sits.